rgastudio is behind the design of the new Caffè Fernanda as part of the project to revamp the Brera Pinacoteca. 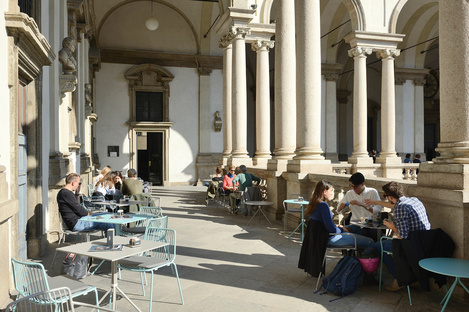 rgastudio is behind the design of the new Caffè Fernanda as part of the project to revamp the Brera Pinacoteca. It is named in honour of the gallery's director, Fernanda Wittgens who was responsible for rebuilding the museum in 1950 after it was destroyed by bombing in the Second World War. When you visit a museum, having a café where you can sit back, relax, munch on something and enjoy a coffee before refocusing on your museum visit is a real plus. And of course, the café should somehow reflect the heart and soul of the institution. Here, Caffè Fernanda by rgastudio located on what used to be the main entrance of the Brera Pinacoteca really ups the ante with its beauty and elegance. The café was named in honour of Fernanda Wittgens, art historian and the first woman to be named the director of a museum in Italy. She was also responsible for rebuilding the Brera Pinacoteca after the devastating bombings in August 1943. The “Grande Brera”, a collection of thirty-eight exhibition spaces designed by Piero Portaluppi, who dedicated it to the late Modigliani was inaugurated on 9 June 1950. Wittgens was determined to create a “living museum”: she filled the halls with flowers, she hosted fashion shows and she extended the opening hours until late in the evening - all very innovative for the times. The project for the new café designed by rgastudio is part of the intention to overhaul all 38 exhibition halls, set in motion by the present director of the art gallery, James Bradburne who arrived three years ago. This also explains the choice of colour: the deep teal hue selected for the walls is consistent with the different warm shades found in all the exhibition halls that were completely revamped to a design by Piero Portaluppi. It also stands as a stark contrast to the incredible works of art hanging in the café itself: the 17th-century painting by Pietro Damini, St. Bernard Converting the Duke of Aquitaine, Bertel Thorvaldsen’s The Three Graces alongside a bust of Fernanda Wittgens by Marino Marini as well as her portrait by Attilio Rossi. Adjustable LED projectors, mounted on rails that mimic the pattern of the existing plaster beams, are the sole source of light, as befits the environment and the works. The splendid peach blossom marble floors and Lepanto red marble door frames that featured prominently in Piero Portaluppi's previous design were restored and left as they were. Damini's 17th-century painting hangs behind the large bar counter with its rounded ends. The bar design is a new take on 1950s-style fluted wood furniture, here inverting the dimensions with an uncharacteristically slender antique brass top offset by large, semi-circular strips of Canaletto walnut wood. The brass and rose-coloured table and chair sets also result from using the same materials for the café furnishing and help lighten up the whole space. They also harmonise it without encroaching on the artworks also displayed in the café itself. Because with Caffè Fernanda, rgastudio has designed a friendly space aimed at raising the Brera Pinacoteca to new heights, in the same style as the museum itself by means of careful architectural choices that underline the beauty of the artworks and of the original area.